During your stay at our Finger Lakes B&B, the area’s natural beauty and cultural events give you so much to see and do. All summer long, there’s been an ongoing event that takes advantage of both. Locals and visitors alike have been enjoying the live summer concerts at Taughannock Falls State Park. There are still a few concerts left. If you love live music and dancing in a lovely outdoor setting, then this is just the thing for you. Go to Taughannock Falls State Park’s south lawn, spread out a blanket on the grass or bring a lawn chair and listen to live local musicians. Don’t forget to bring a picnic basket of refreshments! The wineries of the Cayuga Wine Trail also makes their Finger Lakes wines available during the concerts. Sip your wine and enjoy the music and a view of Cayuga Lake. The weather is balmy and it’s a friendly and fun-loving crowd. These are not concerts to just sit and listen. Bring your dancing shoes and comfortable clothes–you’ll want to dance! Concerts are every Saturday, 7-9pm. The only fee is $5.00 per car parking. Drive to Taughannock Falls State Park off of NYS Route 89. The address is 2221 Taughannock Road in Trumansburg, NY, 14886. Take your blankets/chairs/picnic basket to the south lawn and settle down or get up on your feet for a night of fun. For more information, call (607) 387-6739 or visit TBurgEvents.com. You won’t be able to stay sitting when this Blues and Swing starts playing. Playing a variety of Latin Jazz styles, the band will make you get up and dance. This roots rock band will give you a reason to dance the night away. The Finger Lakes area in New York state is a world-class wine producing region, attracting many visitors who wish to go wine tasting along the Cayuga, Keuka and Seneca Lake Wine Trails. A convenient and safe way to do this is by arranging a wine tour with a local transportation company so that you can enjoy a worry-free experience without the need for a designated driver. An added bonus is having your own tour guide along, with a driver who is capable of tailoring your tour to fit your preferences and desires. Halsey House’s close proximity to these wine trails brings us many customers eager to experience wine tasting in the relaxed and friendly atmosphere the Finger Lakes wineries are known for. We recommend a few local transportation companies that always treat our customers with great service and knowledgeable winery and restaurant suggestions. Two are Guilt Free Touring and Quality Wine Tours. Whether you are looking for an intimate tour for two or you bring friends along to share the fun and the costs, these companies always delight our guests. Pricing begins at around $250 for car and driver for a party of two. Another exciting option is to join a tour designed to show you just what is so special in this magical place of ours. Experience! The Finger Lakes offers daily guided tours for up to twelve people. This tour company isn’t just about wine tasting. Mitch and I recently had the opportunity to accompany our fellow innkeepers on the Wine, Cheese & “Moo” tour. We had the pleasure of visiting Keely’s Cheese Co. and Finger Lakes Dexter Creamery, local artisan cheese-makers, and learned about the cheese-making process while sampling their cheese. Then we moved on to King Ferry and Long Point wineries where we had the chance to pair the cheese with local wines. This was a wonderful chance to get a behind-the-scenes look at great local businesses. Experience! also offers an amazing collection of tours including Culinary & Wine, History of the Area, Gorges and Waterfalls, Hiking or custom tours personalized for you. We highly recommend that you add one of their tours to your itinerary while you are visiting the Finger Lakes. Spring time gives us plenty of good reasons to getaway for a weekend and attend an event at either Cayuga Wine Trail’s Wine & Herb Festival or Seneca Lake Wine Trail’s Spring Wine & Cheese Weekend. The waterfalls are flowing and the trees are beginning to bud. The landscape is coming alive after a long winter. Enjoy a leisurely drive up the lakes as you take in the beautiful scenery between vineyards. With the variety of wines available and numerous wineries to choose from, discovering your favorite wine is like going on a treasure hunt. Bring friends along and share the fun or make some new friends along the wine trail. Seneca Lake Wine Trail’s Spring Wine & Cheese Weekend is being held from Friday, April 29th, at 1:00pm – Sunday, May 1st, 5:00pm. This popular event, sponsored by Cabot Cheese and Macadam Cheese, pairs Finger Lakes wines with a taste of delightful treats prepared using a variety of cheese. This is your chance to visit over 30 wineries and take home a recipe book featuring those tasty treats. Visit the Seneca Lake Wine Trail website for ticket information. It’s time for the Cayuga Wine Trail’s 19th Annual Wine & Herb Festival, running two weekends; April 29th-May 1st and again on May 6th -8th. What a great way to kick-start your gardens and restock your wine cellars. Participants will sample wines along with herb-infused cuisine at 16 wineries and take home an herb or veggie plant from each winery along with recipes and a plant carrier. Save money by purchasing your tickets in advance at the Cayuga Wine Trail website or any Wegman’s store. Spring is literally just around the corner, and in good old New York style, the weather here in the Finger Lakes, NY is changing exactly on cue. The snow melt has produced magnificent rushing waterfalls throughout our region. With over 150 waterfalls to view, you could spend a week in the Finger Lakes and still not see them all. 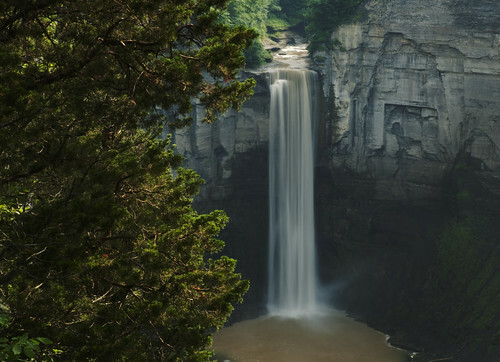 Taughannock Falls State Park begins across the street from our bed and breakfast and the falls overlook is a peaceful two mile walk down country roads and hiking paths. When it comes time for your dinner plans, we love to recommend restaurants that specialize in locavore practices. Hazelnut Kitchen always pleases guests staying at Halsey House, and their location is just three minutes up the road in Trumansburg on Main St. This fine dining restaurant is set in a casual bistro atmosphere and the menu changes each month in order to feature local, seasonal ingredients. Also this Saturday, March 19th, 2011 Knapp Winery & Vineyard Restaurant on the Cayuga Wine Trail will feature their Tour of Europe Wine Dinner which features five delicious courses paired with wines and presented by Executive Chef John McNabb. Yesterday delighted us with 60 degrees and sunshine, a great way for Mother Nature to celebrate St. Patrick’s Day and it put us in the mood for some fun. Today the forecast is for mid 60’s and just a slight chance of rain. This should be just enough to melt the last remaining spots of snow and already the grass is turning green. If you have never experienced the countryside of upstate New York, Spring is an excellent time to shake off the winter doldrums and come breathe the fresh air. And, a bottle or two of some fine Finger Lakes wine will certainly enhance the mood. Spring has come to Upstate NY and the Finger Lakes wine trails are grooming their vineyards for another great year. To set this season off, the Cayuga Wine Trail is offering their 18th Annual Wine & Herb Festival on the weekends of April 23rd – 25th and April 30th – May 2nd, 2010. Sample herb prepared foods along side fine wines, and take home wine glasses, recipes and herbs or vegetable plants from each winery. The Seneca Lake Wine Trail’s Spring Wine & Cheese Weekend is also on April 23rd-25th, 2010. This self-guided tour pairs the flavors of local cheese makers with wonderful Finger Lakes wines. You will take home a gift item and recipe book, along with beautiful memories of the scenery along Seneca Lake. Tickets are available at the door at certain wineries. Click here for more information. Check out the Halsey House B&B availablity calendar for your getaway weekend. Come stay in ultimate comfort, taste great wines and take home herbs and vegetables for your garden or recipes for your kitchen. Halsey House has a list of recommended local limousine and touring companies to offer you tours tailored to fit your needs. Go wine tasting on the Cayuga Wine Trail, Seneca Lake Wine Trail and the Keuka Lake Wine Trail with your own personal designated driver. Bring friends along on a wine tasting weekend and share the costs as well as the fun. Prices are based on number of participants and duration.